The images were then stored on-board, on a tape recorder but because of competing planetary missions the data took until May 1990 to arrive back on Earth. Despite Voyager 1 being more than 6 billion kilometres from Earth, the three exposures ranged only between 0.48 and 0.72 seconds in duration. But the data took five and a half hours, travelling at the speed of light, to span the distance between the spacecraft and Earth. Three images (separately in blue, green and violet light) were combined to produce the now famous Pale Blue Dot image, Voyager 1’s “selfie” of Earth. It is an image that contains all of Earth and yet NASA says Earth was a crescent at the time and only 0.12 of one pixel in size. Earth has a blue appearance due to reflected light scattering off oceans, clouds and land. The faint band of light in which it is seemingly suspended is not some celestial filament but an artifact of scattered sunlight. 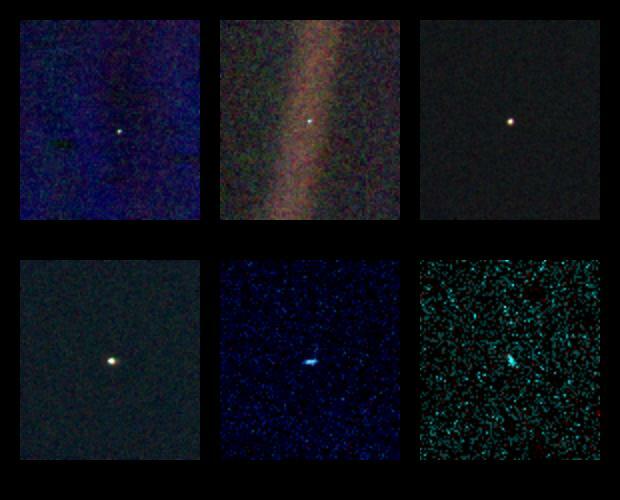 Pale Blue Dot was part of a remarkable larger “family” portrait of the solar system, an idea the famous American astronomer Carl Sagan, a member of the Voyager imaging team, came up with many years before 1990. Despite our planet being so small, the image has a strangely magical quality in which for the first time we can begin to appreciate our place, not only in the much larger solar system, but in the galaxy we reside, that is part of our universe. ‘portrait’ of the solar system taken by Voyager 1. 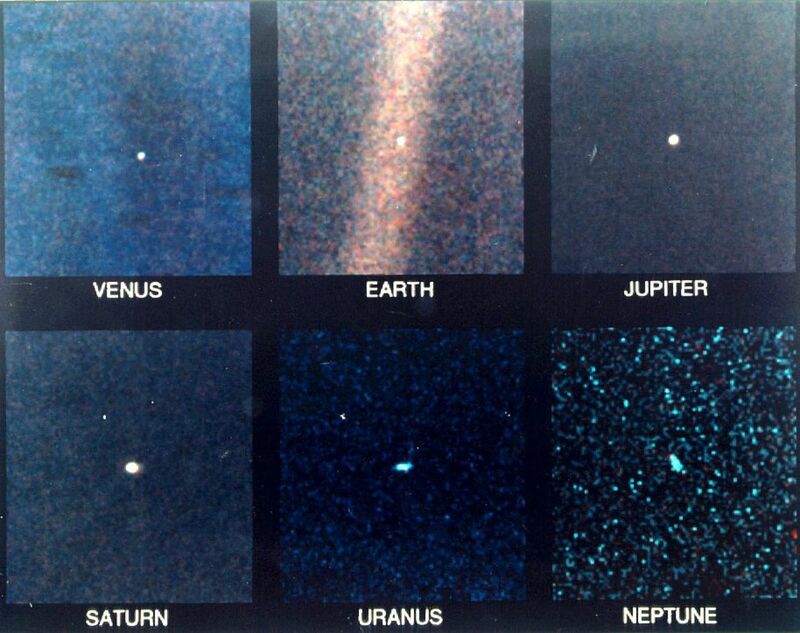 Our Earth dot is not distinguishable from the other dots in the larger solar system portrait. Yet, it is of course special. For one thing, in 1977 we launched a spacecraft called Voyager 1 from that dot. The Pale Blue Dot was not the first image of Earth taken from space. On Christmas Eve 1968, Apollo 8 astronauts William Anders, James Lovell and Frank Borman were in lunar orbit and took several images of an Earth rising above the moon’s horizon. 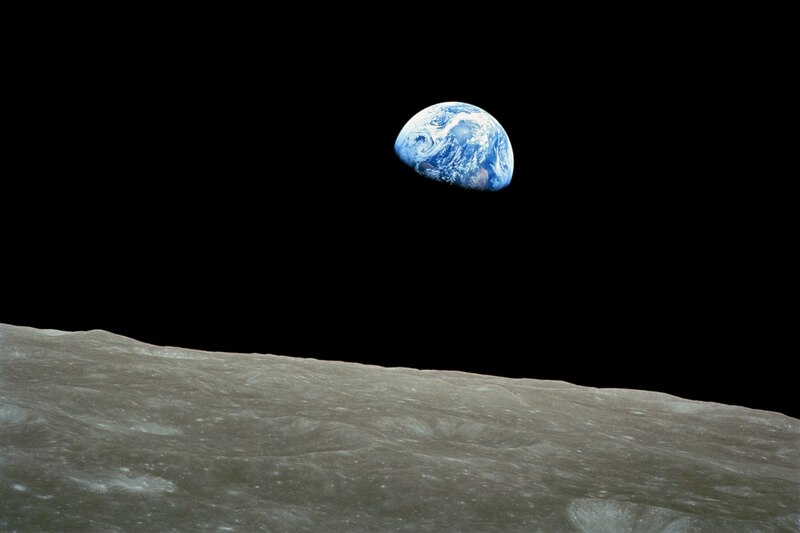 One image in particular – known as Earthrise – has resonated like the Pale Blue Dot. The image of a hemispherically illuminated blue sea, white cloud (with traces of brown land) Earth seemingly floating above the lunar horizon as the astronauts orbited the moon, is iconic. The Earth was too small to easily identify known features. Craters and other features of the moon’s surface clearly show that the photographers had left their home. You can watch a recreation of the time in the mission when the images were taken in this video (below). Apollo astronauts, the first to journey to the moon, were also the first humans to take images of the whole Earth. At such distances, at least in the daylight part, cities and evidence of humans are invisible. Frank, what I keep imagining is if I am some lonely traveller from another planet what I would think about the Earth at this altitude, whether I think it would be inhabited or not […] I was just curious if I would land on the blue or brown part of the Earth. 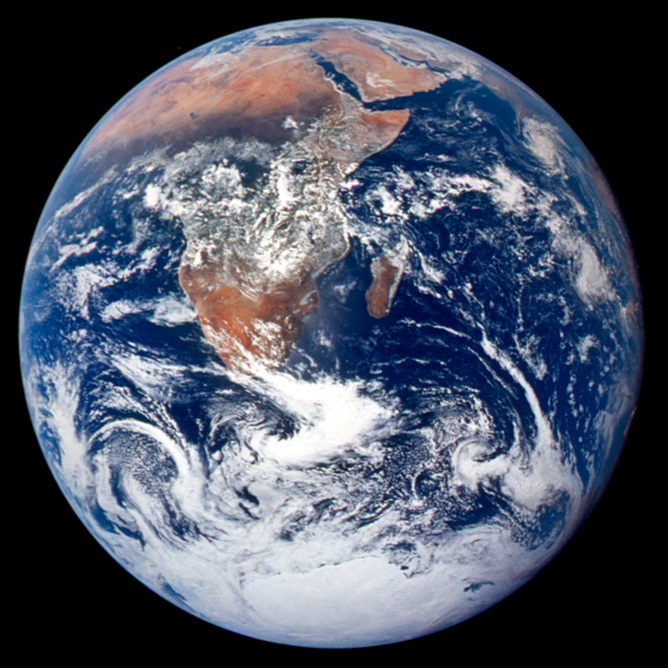 In December 1972, only four years after Apollo 8, the Apollo 17 crew took one of the most famous and widely used whole-Earth images from a distance of 45,000km on its outbound leg, dubbed the “The Blue Marble” for obvious reasons. Similar whole-Earth images had been taken as early as 1967 by satellites but the Blue Marble combines human photographer, a unique alignment of sun, spacecraft and Earth and the most artistic (even abstract!) mix of land, ocean and cloud. This combination has elevated this image above many similar ones. It is an Earth we know. 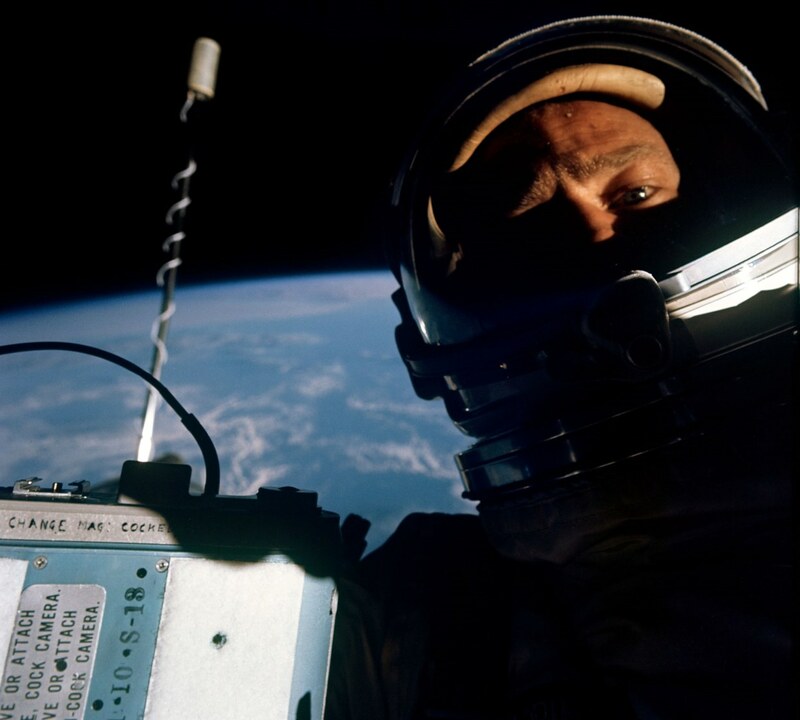 The first human selfie in space – which also includes Earth – was seemingly taken by Edwin “Buzz” Aldrin in 1966 during the Gemini 12 mission. Edwin ‘Buzz’ Aldrin during the Gemini 12 mission in 1966. Note that this was taken while in a bulky spacesuit, wearing thick gloves, pre-smartphone and many years before the common use of the selfie-stick. Selfies of International Space Station (ISS) residents and even ISS spacewalkers appear regularly in social media and these images now seem to be somewhat expected and slightly mundane. Not to be outdone, machines have joined the quest for self reflection. As far back as 1976 the Viking 2 lander on Mars took partial self-portraits, containing part of the lander with the Martian horizon in the background. In 2013, also on Mars, NASA’s Curiosity rover took 66 high-resolution images, which together made this wonderful self-portrait. 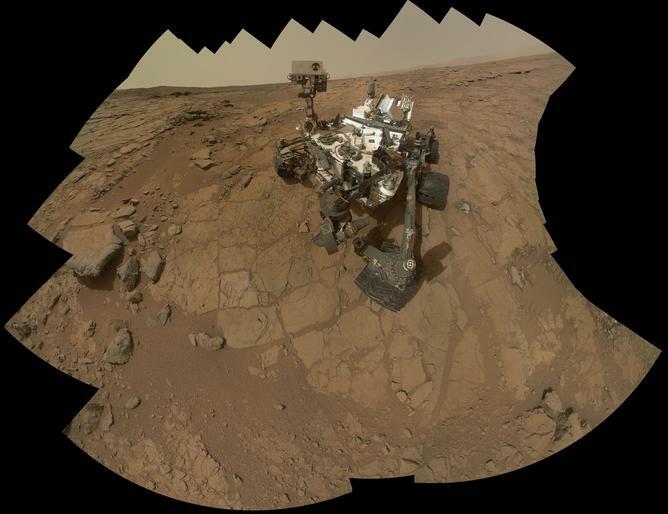 A self-portrait of NASA’s Mars rover Curiosity. But selfies of robots do not strongly resonate with me. What strikes me the most are images of Earth taken by us or our machines. Whether it is from high orbit, en route to the moon, from another part of the solar system or even from outside the solar system, our ability to take images of our planet has changed our perspective forever. It is us we are looking back upon. Most of the Apollo astronauts commented that their original mission objective was the moon, yet their biggest impact came from viewing the (their) Earth. It’s tiny out there […] it’s inconsequential. It’s ironic that we had come to study the moon and it was really discovering the Earth. In the near future the images taken during Apollo will be joined by images of Earth taken from human travellers to, and residents of Mars. In the short term though the Pale Blue Dot will not be matched in the impact and reaction it creates. In that one dot is our 5 billion year old planet with its unique mix of favourable position from the sun, liquid water, tectonic activity, thin atmosphere, life and unique flora and fauna. It represents all human history, our discoveries, our evolved intellect, our social achievements, our destructive wars, our families and loved ones, all those before us and the current seven billion humans and rising, in lockstep with increasing environmental and resources impact. Voyager 1 is now more than 19 billion kilometres from Earth. It has travelled 13 billion kilometres in the 25 years since since taking the original Pale Blue Dot. Even if the camera that took the image could be brought back to life, it is unlikely a similar set of images would detect Earth. From the more distant Voyager 1 perspective Earth is both fainter by a factor of ten and closer to a still bright sun. Voyager 1 is now regarded as being in interstellar space, as it is outside the influence of our sun and is travelling toward the constellation Ophiuchus. In the year 40,272 AD, Voyager 1’s next encounter will be to come within 1.7 light years of a star in the constellation Ursa Minor called AC+79 3888. What will Earth look like in 40,272 AD? More importantly, what will Earth look like in 4027 AD, only slightly more than 2,000 years from now? Will future spacecraft over the next 2,000 years take as potent images as Pale Blue Dot, Earthrise or the Blue Marble? Apollo showed a recognisable but seemingly fragile home planet. Voyager 1 showed an unremarkable dot much like several others in our star’s planetary system. Has the evolving Earth “selfie” changed our behaviour? Human selfies are often perceived as having a negative narcissistic component. The Earth “selfie” has only positive attributes. […] when we contemplate the whole globe as one great dewdrop, striped and dotted with continents and islands, flying through space with other stars all singing and shining together as one, the whole universe appears as an infinite storm of beauty. Such self-portraits of Earth should make us continually ask are we worthy stewards to help navigate our home through John Muir’s stormy yet beautiful universe?